CBI - China: Day 32 of 154 of the Japanese Invasion of Manchuria. Spain: Day 95 of 985 of the Spanish Civil War. Spain: Day 460 of 985 of the Spanish Civil War. CBI - China: Day 105 of 2,987 of the 2nd Sino-Japanese War. Day 68 of 106 of the 2nd Battle of Shanghai. Day 49 of 70 of the Battle of Taiyuan. Spain: Day 825 of 985 of the Spanish Civil War. CBI - China: Day 470 of 2,987 of the 2nd Sino-Japanese War. Day 131 of 139 of the Battle of Wuhan. Day 8 of 81 of Japan's Operation GUANGDONG. Poland: Germany officially incorporates western Poland into the Reich. CBI - China: Day 835 of 2,987 of the 2nd Sino-Japanese War. Atlantic: Convoy sailing from Canada to Britain is attacked by 5 U-boats sinking 12 ships. ETO - UK: Day 44 of 258 of the Blitz. ETO - UK: Day 102 of 114 of the Battle of Britain. The destroyer HMS VENETIA sinks after hitting mine in Thames Estuary. East Africa: Day 132 of 537 of Italy's East African campaign in the lands south of Egypt. CBI - China: Day 1,201 of 2,987 of the 2nd Sino-Japanese War. Day 340 of 381 of the Battle of South Guangxi. CBI - Thailand: Day 19 of 221 of the Franco-Thai War (Vichy France vs Thailand). Russian Front - Center: Day 18 of 98 of the Battle of Moscow. Army Group Centre finally clears the Vyazma pocket capturing 670,000 Russians, 1,000 tanks and 4,000 guns. 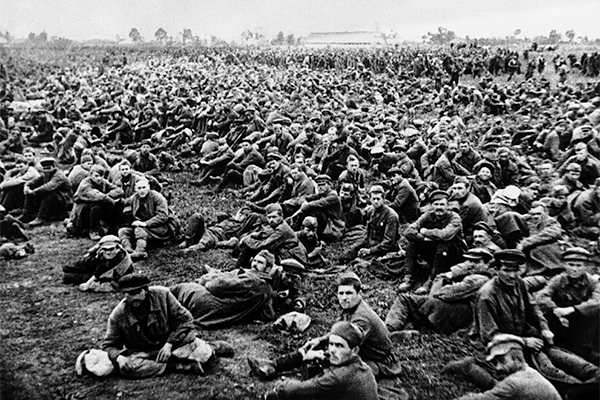 Oct 41: Some of the 670,000 Russian prisoners captured by the Germans at Bryansk and Vyasma, awaiting transport to POW camps. As German Army Group Centre continued to break through toward Moscow, the Red Army was desperately trying to buy time for a build-up and concentration of reserves to fend off what was looking to the world like a lost cause. The large number of captured Russians and their tanks and guns this day seemed to be spelling nothing but doom and gloom for the Soviet Union's Great Patriotic War. As perhaps Hitler's biggest blunder of the entire war (other than the invasion itself), he halted the offensive toward Moscow, sending many German units south to help attack the strategically unimportant city of Stalingrad. Hitler reasoned that Moscow could be easily taken at a future date. No need to finish it off right now. By the time Hitler resumed the offensive, however, the onset of autumn rains had already started bogging down the German advance. The resistance of the main Soviet forces on the Tula, Kalinin, and Mozhaisk defensive lines was very stubborn, further slowing the German advance. With only 90,000 men and 150 tanks left for the defense for Moscow, the city was put under a "state of siege" on 19 Oct 41 and their resolved stiffened. But the weather was steadily deteriorating, getting colder each day, which would eventually do to Hitler what Russian winters had done to Napoleon and Sweden's King Charles before him. Russian Front - Finland: Day 113 of 142 of Operation SILVER FOX, a joint German-Finnish campaign to capture the Russian port of Murmansk in the Arctic. Russian Front - Finland: Day 111 of 140 of Operation ARCTIC FOX, a joint German-Finnish campaign against Soviet Northern Front defenses at Salla, Finland. Russian Front - Finland: Day 120 of 164 of the Battle of Hanko. The Soviets will be forced off their leased naval base. Russian Front: Day 120 of 167 of Germany's Operation BARBAROSSA. Russian Front - North: Day 42 of 872 of the Siege of Leningrad. MTO - Libya: Day 193 of 256 of the Siege of Tobruk. East Africa: Day 497 of 537 of Italy's East African campaign in the lands south of Egypt. CBI - China: Day 1,566 of 2,987 of the 2nd Sino-Japanese War. PTO - Japan: Giving no names or details, the Japanese announce that eight of the captured Doolittle Raiders have been tried and sentenced to death, but say that several were commuted to life imprisonment. Russian Front - North: Day 407 of 872 of the Siege of Leningrad. Russian Front - North: Day 168 of 658 of the Siege of the Kholm Pocket, USSR lays siege to the Kholm Pocket but the Germans hold out for a about a year and a half. Russian Front - South: Day 114 of 150 of Germany's CASE BLUE, the failed offensive to take the Caucasus oil fields. Russian Front - South: Day 58 of 165 of the Battle of Stalingrad, bloodiest battle in human history. MTO - Libya: US B-24s scores a direct hit on a ship at Tobruk. MTO - Egypt: US B-25s and RAF warplanes attack enemy landing grounds behind the El Alamein front. East Africa: Day 168 of 186 of the Battle of Madagascar. CBI - China: Day 1,931 of 2,987 of the 2nd Sino-Japanese War. PTO - Alaska: Day 135 of 435 of the Battle of Kiska, Aleutian Islands. The US and Canada will defeat the Japanese invaders. PTO - Malaya: Day 243 of 357 of the Battle of Timor Island, a long guerrilla war ending in Japanese victory. PTO - New Guinea: Day 91 of 119 of the Battle of the Kokoda Track. The Australians continue pushing back the Japanese troops. PTO - Solomon Islands: Day 74 of 187 of the Battle of Guadalcanal. Russian Front - North: Day 772 of 872 of the Siege of Leningrad. Russian Front - North: Day 533 of 658 of the Siege of the Kholm Pocket. USSR lays siege to the Kholm Pocket but the Germans hold out for a about a year and a half. Russian Front - South: Day 57 of 122 of the Battle of the Lower Dnieper River, USSR. Russian Front - South: Day 4 of a Soviet attempt to breakout from the Bukrin Bridgehead south of Kiev. This bloody attempt comes to a halt as the Germans have kept the Soviets pinned down. MTO: In Italy, US 5th Army along the Volturno river bogs down due to bad weather and a skillful German defense. US 12th Air Force provides air support. CBI - China: Day 2,296 of 2,987 of the 2nd Sino-Japanese War. PTO - New Guinea: Day 31 of 219 of the Battle of Shaggy Ridge. PTO - New Guinea: Day 28 of 162 of the Battle of the Huon Peninsula. Will result in an Allied victory. ETO - France: Day 80 of 284 of the Battle of Brittany. ETO - Belgium: Day 48 of 62 of the liberation of Belgium. ETO - Belgium: Day 18 of 38 of the Battle of the Scheldt Estuary. ETO - France: Day 35 of 236 of the Siege of Dunkirk. ETO - Germany: Day 31 of 145 of the Battle of Hürtgen Forest. ETO - Germany: US 8th Air Force B-17s and B-24s hit targets inside Germany. Russian Front - Finland: Day 35 of 223 of the Lapland War. Finland and Russia have joined forces to kick the Germans out of Finland's most northern province. Russian Front - Finland: Day 13 of 23 of the Petsamo-Kirkenes Offensive. The Soviets will drive the Germans out of the Arctic region in northern Scandinavia. Soviet troops are in Norway. Russian Front - North: Day 36 of 41 of the Battle of Riga, Latvia. Russian Front - Center: Day 5 of 206 of the Battle of the Courland Pocket in Latvia. Germans will hold this area until the very end of the war. Russian Front - Center: Day 15 of 18 of the Battle of Memel, a border town of Lithuania and East Prussia. The Germans continue to hold the Niemen line to cover East Prussia. Russian Front - Center: Day 36 of 72 of the Battle into East Prussia and northern Poland. Russian Front - Center: Day 4 of 15 of the Battle of Goldap, East Prussia. The German 4th Army withdraws from the Tilsit area. Russian Front - South: Day 14 of 24 of the Battle of Debrecen, Hungary. Russian Front - South: Day 36 of 72 of the Battle of Belgrade, Yugoslavia. German troops begin evacuating from Belgrade. MTO - Italy: US 12th Air Force B-25s and B-26s attack numerous targets in Italy. CBI - Burma: Day 202 of 302 of the Chinese Salween Offensive in Burma. British troops capture an important Japanese supply depot at Mohnyin. CBI - China: Day 2,662 of 2,987 of the 2nd Sino-Japanese War. Day 186 of 259 of Japan's Operation ICHI-GO. PTO - New Guinea: Day 181 of 481 of the Battle of Western New Guinea. PTO - Palau Islands: Day 35 of 74 of the Battle of Peleliu (Operation STALEMATE II). PTO - Palau Islands: Day 33 of 36 of the Battle of Angaur. A Third Reich reference book, arranged by topic, gives insight into the twisted madman's regime and his speeches that mesmerized so many.